language and relays it to another person or group of people in a different language. ensuring that justice is served. A professional interpreter is an invaluable resource in any face-to-face negotiation, communicating your meaning and intent to your customer, and vice versa. Interpreters have nerves of steel. information back in another language, almost instantaneously. Want to experience the stress yourself? don't know; there's no time. situations where a professional interpreter makes all the difference. and the culture behind the words, in two or more languages. Bilingual? That's like my brother-in-law. He speaks Spanish. information between two languages, especially when the pressure is on. can skew a critical exchange. 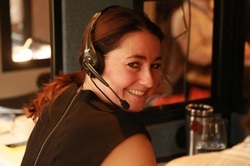 Professional interpreters bring a different approach and skill-set to the job. exactly what the other party is saying. huge waste of human and financial resources. been convicted and guilty parties set free due to incompetent interpreting. as interpreters in healthcare situations and in courtrooms. very bad outcomes for the patient."